Thu., Feb. 1, 2018, 5:25 a.m. Priest Lake’s abundant lake trout population will not be suppressed, Idaho Fish and Game told stakeholders last week. The decision comes after six months of public input and feedback on the best way to balance Priest Lake’s surging lake trout population with other struggling fish species. Some anglers advocated for suppression of lake trout in hopes of reviving the kokanee population – much like what has been done on Lake Pend Oreille. However, others resisted any suppression of Priest Lake’s mackinaw population, also known as lake trout, worried that it would irrevocably damage the productive fishery. After several public meetings and surveys it became clear that the public did not overwhelmingly support changing management practices, said Andy Dux, IFG’s regional fisheries manager in Coeur d’Alene. Anglers surveyed both by mail and email were nearly evenly split on the decision. “What that told us is that there is not an overwhelming support for change,” Dux said. According to a random mail-in survey of fishing license holders, 52 percent of anglers didn’t want a change while 48 percent did. The agency surveyed fishing license holders from Idaho’s five northern counties and Spokane and Pend Oreille counties. The email survey of fishing license holders who provided an email found that 55 percent of anglers supported a change while 45 percent did not want a change. Dux said if public opinion had been strongly in favor of changing management IFG would have responded. However, because of the divided opinion, he said, the agency opted to stay the course. Steve Booth, a lifetime resident of the Priest Lake area, was disappointed by the decision. Booth was a member of the Priest Lake Fishery Advisory Committee. Of the dozen or so members he said they were roughly split on how to manage the lake. Booth said the advisory committee was effective and he called the whole process fair, even if he disagrees with the outcome. Booth is particularly concerned about the impact increasing lake trout populations could have on native species living in upper Priest Lake. Currently, IFG suppresses the lake trout population in upper Priest Lake through an annual gillnetting program. Dux said as long as those management efforts continue the native species in the upper lake should survive and thrive. The annual netting program started in 1997 and has improved survival rates of westslope cutthroats and bull trout. “The only risk for it is that we have to continue to be able to get funding support to do that work,” Dux said. Those surveyed overwhelmingly supported protecting native species in upper Priest Lake. Initially, proponents of maintaining the status quo worried that suppressing lake trout and trying to reintroduce native species wouldn’t work, leading to a damaged or destroyed lake trout fishery with no viable replacement. “We have a nice fishery and we didn’t want to risk unnecessarily damaging the fishery,” said Ken Hagman. But, he said that over the last few years the Priest Lake fishery has evolved – on its own. There has been a large increase in the number of small mouth bass in the lake. Those bass have “scarfed up” feeder fish and are starting to impact the fingerling cutthroat, Hagman said. He believes that IFG should continue to study the lake and hold off on a wide-scale management decision. “I just want it known that IFG has done a remarkably great job of studying this lake,” he said. Historically Priest Lake’s main native fisheries were westslope cutthroats, bull trout and mountain whitefish before lake trout were introduced in 1925 and kokanee – landlocked sockeye salmon – were successfully introduced with releases in 1942, 1943 and 1944. That fragile balance of predators and prey fish lasted into the 1970s. Priest Lake produced Idaho’s state record 57.5-pound lake trout in 1971, but that fish essentially marked the end of an era. The fishery anglers had come to expect was falling apart. Mysis shrimp, a small freshwater shrimp, were introduced into Priest Lake in the late-1960s as sportsmen and fisheries biologists sought to beef up trophy fisheries. Lake trout scarfed the shrimp and their populations grew, eventually leading to the collapse of the kokanee. 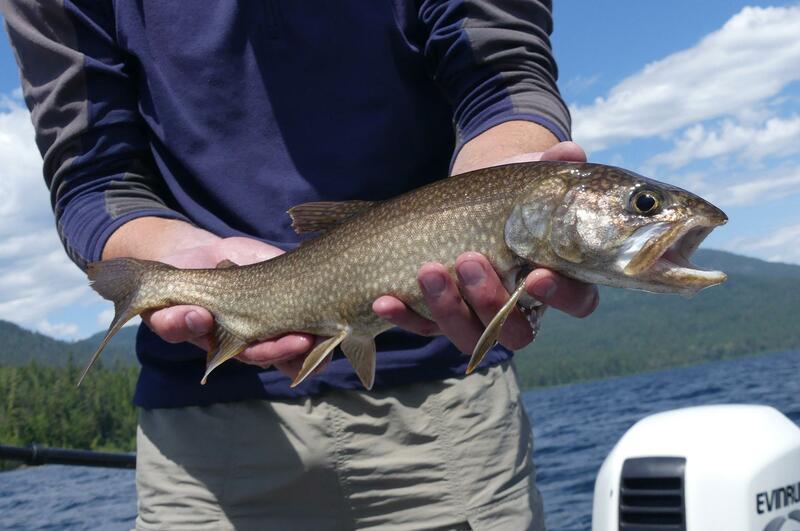 Priest Lake was soon dominated by lake trout, which have averaged out to smaller sizes. Lake trout feed and prosper on mysis shrimp for their first five years, but after that they need more forage fish to continue growing. In the 1990s, IFG zeroed in on the smaller Upper Priest Lake to make a stand for native fisheries. The upper lake is linked to Priest Lake by the 3-mile-long Thorofare. Dux, via email, emphasized the importance of the native species fishery in the upper lake. Published: Feb. 1, 2018, 5:25 a.m.